In honor of Emma’s 200th anniversary, the Minneapolis Institute of Art is sponsoring an Austen exhibition in two of its beautifully restored period rooms. The installation is part of the museum’s “Living Rooms” series, which seeks to immerse visitors in historically specific settings. The Queen Anne chamber temporarily houses the “Jane Austen Reading Room” section of the exhibition. The rich 18th century wood paneling, purchased from Charles Robeson in 1932, transforms this space into a late Baroque architectural style (MIA website). The Reading Room has a dual purpose. It brings a tiny nook off the Chawton House’s dining room to life (where Austen used to read books from her brother’s library), and it allows current visitors to experience this cozy atmosphere of reading and reflection. Visitors are encouraged to sit in the two yellow armchairs (complete with “sit” and “stay” pillows) in front of a simulated fire crackling in the fireplace. To enhance the experience, a small table and two bookshelves are filled with modern copies of Austen’s letters, works, and spin-offs that she inspired (like Pride, Prejudice, and Zombies). If you peer into the room at any point in the afternoon, you will likely find Austen enthusiasts sitting in the chairs and curiously leafing through the various editions. The second section, within the Georgian drawing room, imaginatively captures the world of Emma. The organizers have arranged the space in order to create the sense that its characters have just left the room. A word game haphazardly spills across a corner table, a half-finished watercolor painting leans against an easel, and a writing instrument rests on several letters. The exhibit uses these details to envision that “Emma’s father has just left his shawl behind, players have paused their word game, and Emma has been distracted from her projects of reading, writing, and painting” (MIA exhibit sign). This in media res sensation grants immediacy to the collection of artifacts and replicas. Even with seemingly small details, the curators used creativity and historical research to animate the design. For instance, the exhibitors wanted to show Emma’s penchant for painting. The lack of a real counterpart, however, posed an immediate dilemma. Bill Skodje, the museum’s senior art preparator, researched period- specific paper types and color combinations in order to create an original work of art (MIA website). 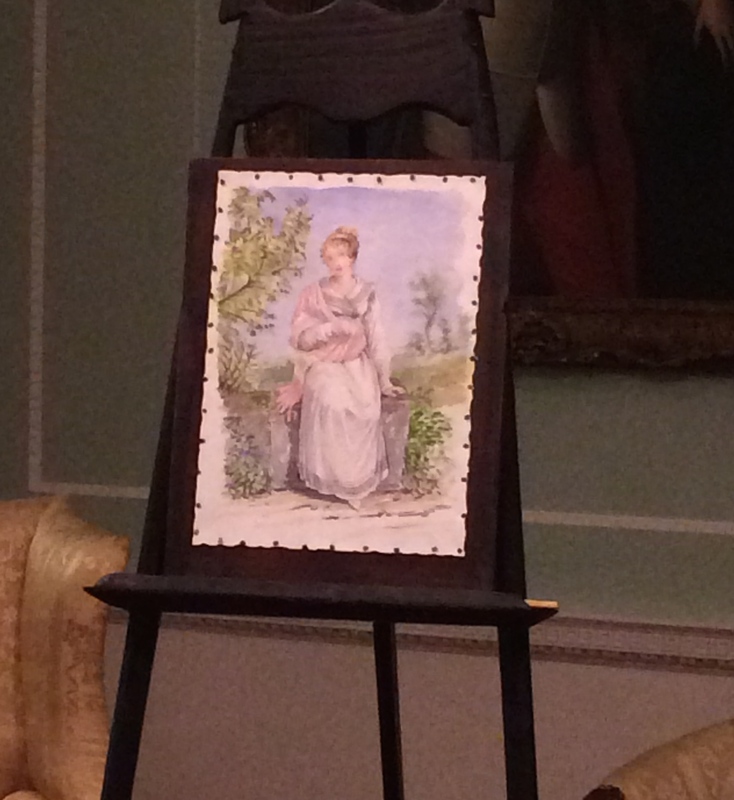 He relied on landscape details from an existing portrait by Austen’s sister, Cassandra. Around the room’s perimeter, there are also transcripts of Austen’s letters, a reproduction of Austen’s travel desk, and first edition copies of the three-volume set of Emma. Like the Reading Room, the drawing room seeks to unite its visitors’ imaginations with historical recreation and personal experience. 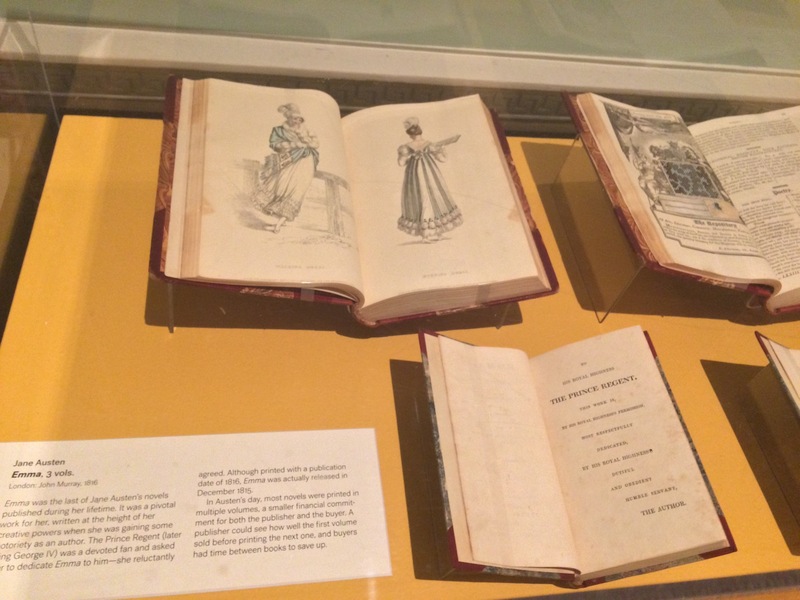 The Jane Austen Exhibition will be on display at the Minneapolis Institute of Art until June 26th. Originally Posted on Eighteenth- and Nineteenth-Century Subfield.